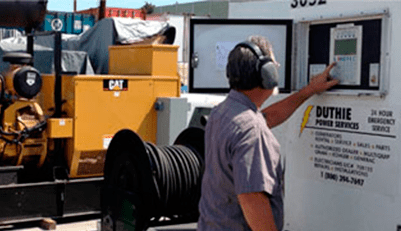 A load bank is a piece of equipment that we use when testing an emergency generator. The test usually consists of a timed event which also includes the KW. As we go through the steps of the test, it will simulate a load on a generator (it’s actually an artificial load). The test is in timed increments that would involve KW increments as well. During this, we would take readings and validate the generator’s output. The one you see behind me is a 1500 KW load bank. We have other ones to be used for different sized generators. There are also smaller generators that require a suitcase style load bank – Duthie provides those as well. For more information about a load bank test or to request a quote, click here https://duthiepower.com/request-a-quote . Or give us a call at 1-800-899-3931 to discuss more about load bank testing.